The month ended with fitting March 2019 conditions, i.e. too much wind! Birding along the coast provided some close views of regular species including quite a few Common Gulls (Stormmåge) and Black-headed Gulls (Hættemåge). 3 Red-throated Divers (Rødstrubet Lom) and plenty of Common Scoter (Sortand) were rafting just off the shore too. A Black-throated Diver (Sortstrubet Lom) and some Velvet Scoter (Fløjlsand) were observed further out at sea. Although it was not feasible to carry out the standard ringing today, we do have an important ringer-related update, one which brings great experience and company to the station. Morten Jenrich Hansen arrived this afternoon and will be working here for the rest of the spring season! 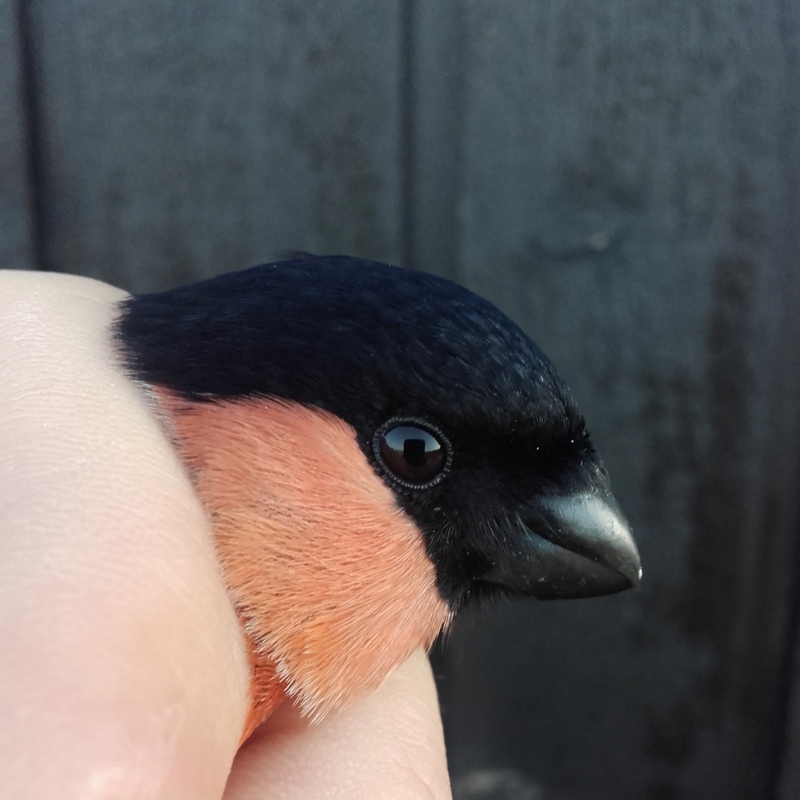 Today the first Bullfinch for this season was ringed, a male, following the female bird recaptured earlier this week. Otherwise Goldcrests and Robins are evidently returning in good numbers. Once again the last capture of the day was particularly interesting, with a recapture of a Short-toed Treecreeper (Korttået Træløber). 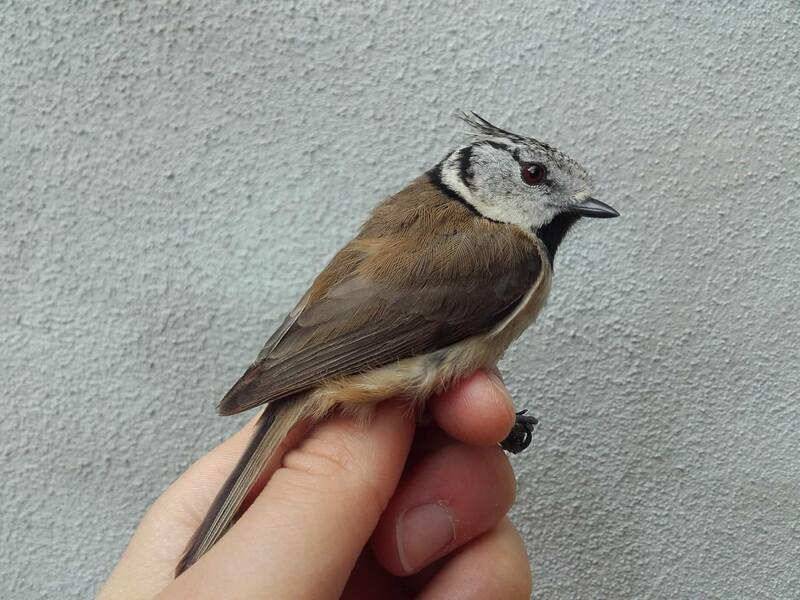 A great recovery to log for this species at Blåvand, ringed here in April 2017. 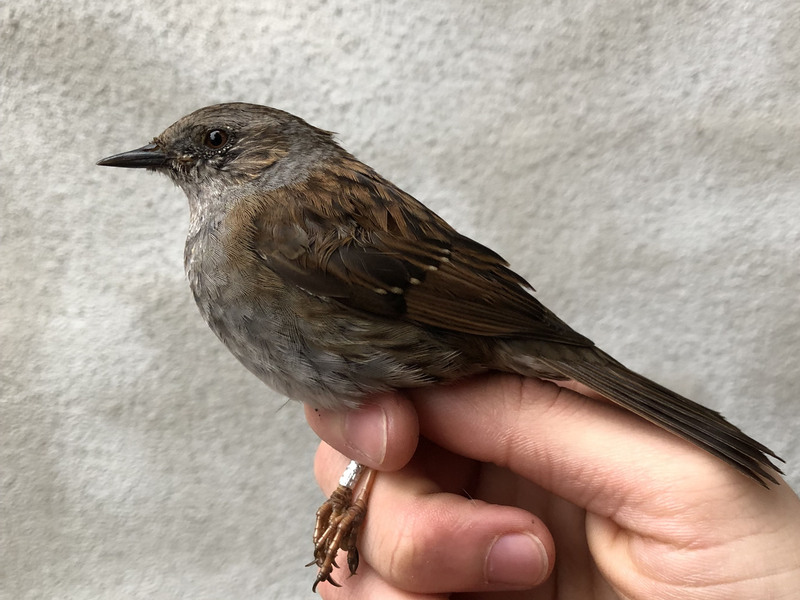 Apart from the ringing, a couple of Starlings (Stær) and Tree Sparrows (Skovspurv) seemed to show interest in the nest boxes at the station, while Siskins (Grønsisken), Meadow Pipits (Engpiber) and a female Black Redstart (Husrødstjert) were present around the lighthouse. The lovely morning weather also enticed a few Vipera berus to bask in the sun. After a clear night sky, a bright and birdsong-filled morning ensued. South-westerly wind contributed to quite a warm day for migration, with some Chiffchaffs, Goldcrests and thrushes moving through. 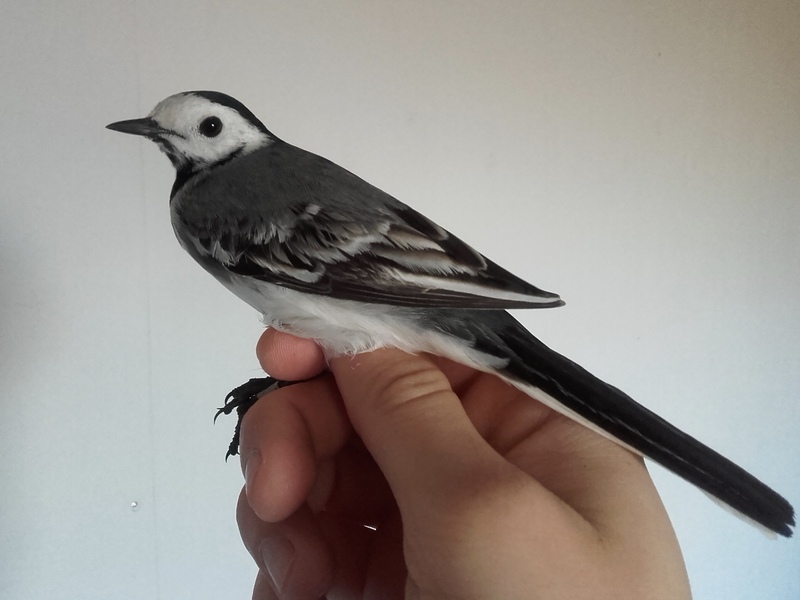 Although not a peak day this month, we ringed the second Redwing, as well as the first White Wagtail this spring (adult male). 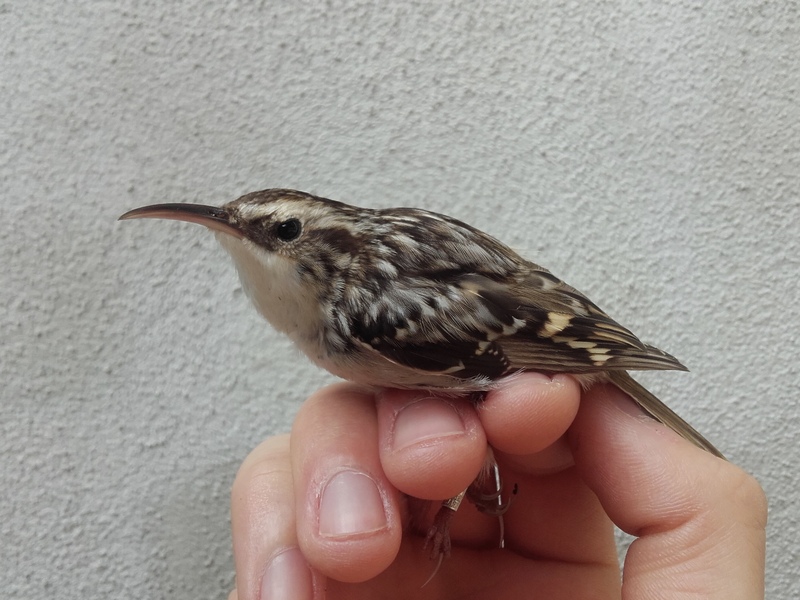 An adult female was also recaptured, shown below. The weather conditions improved overnight. We mostly ringed Blackbirds today and had many, many more of them hopping around. 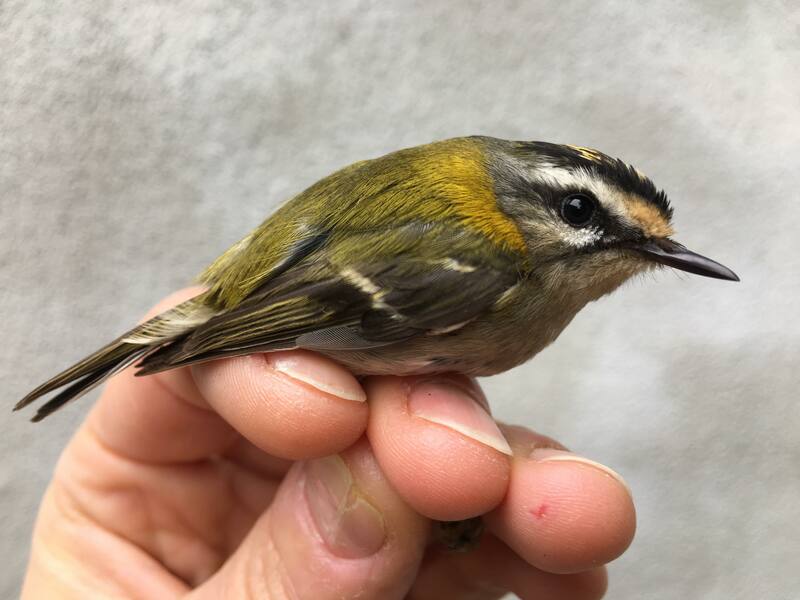 We also had a female Firecrest, the sixth individual this month. 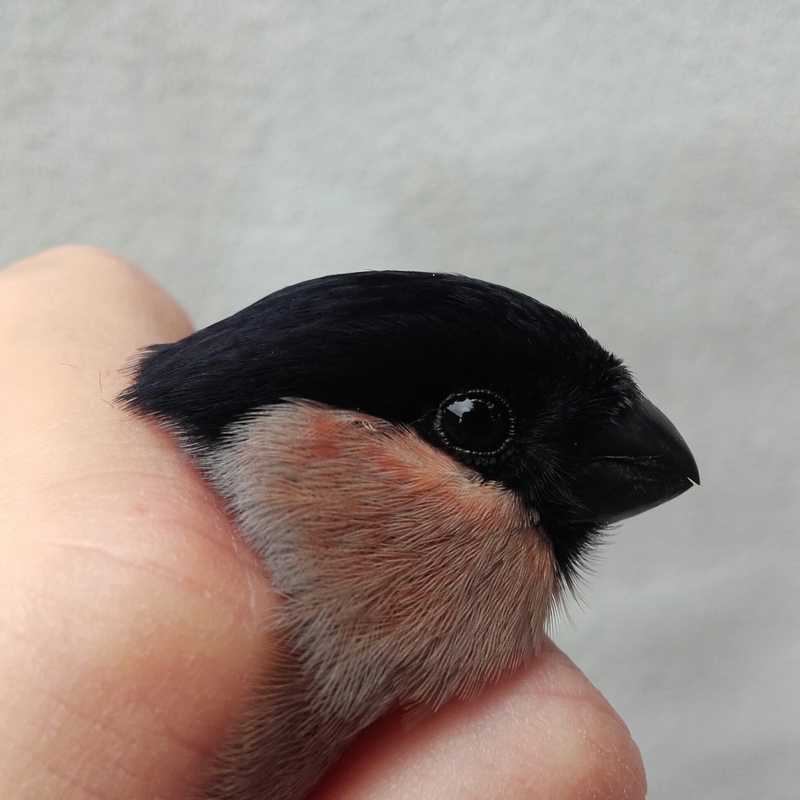 The last bird was a Bullfinch (Dompap) recapture, ringed at the station in 2018. A few hours of morning birding and sea watching by Jan went well, with numerous Red-throated Divers (Rødstrubet Lom) and gulls migrating north. These included several dozen Lesser Black-backed Gulls (Sildemåge), a Black-throated Diver (Sortstrubet Lom) and even an Arctic Skua (Almindelig Kjove) - as far as I know it's the first this spring! Looking forward to the imminent return passage of a few Sandwich Terns (Splitterne), Northern Wheatears (Stenpikker) and so many other species. 8m/s winds and frequent showers on site this morning, yet more Redwings (Vindrossel) and Greenfinches (Grønirisk) than I've seen so far. Mostly observed between the station and lighthouse gardens, 10+ Greenfinches and a couple of Redwings were at one point all feeding in the car park area. The morning hours were not ideal, as both rain and wind gusts exceeded the weather forecast. Afternoon sea watching included 1 Gannet (Sule), 4 Red-throated Diver (Rødstrubet Lom) and a few Common Scoter (Sortand). The usual gulls and waders were also present, avoiding the 'sandstorm' patches of the beach. 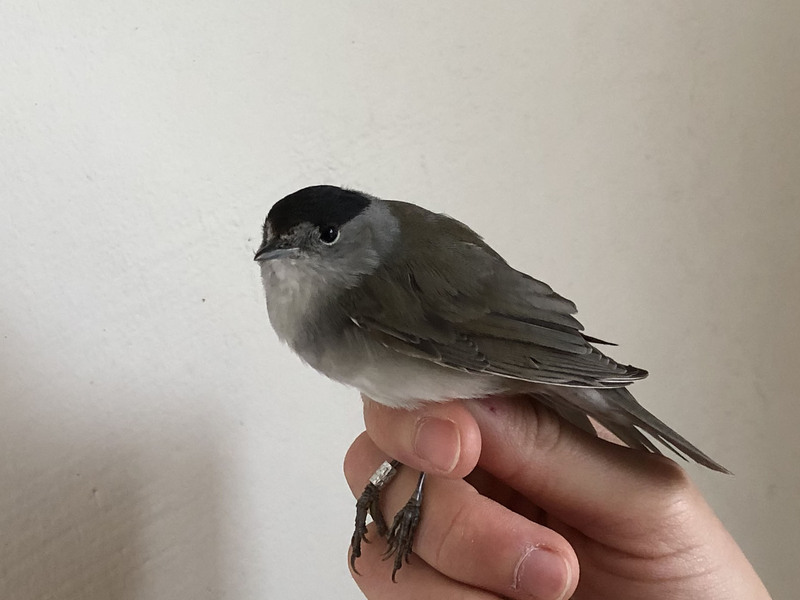 Two ringed White Wagtails (Hvid Vipstjert), vocal Song Thrushes (Sangdrossel) and Chaffinches (Bogfinke) occupied the lighthouse garden while work on improving the vegetation within the helgoland trap was underway. More shrubs were planted at the widest entry section and some birds, particularly thrushes, were already frequenting these new trees by the evening. Strong winds hindered the ringing this morning, and persisted throughout the day. We found some shelter in the dunes and later on the beach for some birding. There seemed to be few predated toads near the ponds, probably taken by Hooded/Carrion Crows (Gråkrage/Sortkrage). Though a relatively slow morning, we did spot 4 (3,1) Red-breasted Mergansers (Toppet Skallesluger) migrating north, plus a few Sanderlings (Sandløber), Black-headed Gulls (Hættemåge), 1 Rook (Råge) and 4-5 Snow Buntings (Snespurv). Bird species present in good numbers today include Meadow Pipit (Engpiber) and Blackbird (Solsort). Later, a few Oystercatchers (Strandskade) were observed feeding along the coast. With quite high tide, the Herring Gulls (Sølvmåge) and Common Gulls (Stormmåge) were less numerous by the evening. The morning air was once again filled with Goldcrest and Firecrest chirps. A handful of Dunnocks and Blackbirds also made their presence known, followed by a beautiful Redwing. The light southerly breeze perhaps facilitated its arrival, the first individual seen here this season. 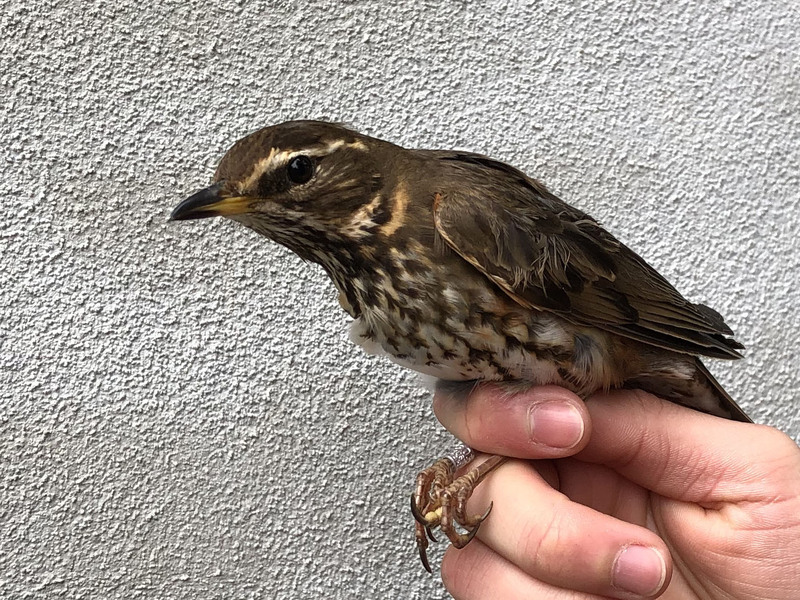 Other thrushes such as Fieldfare (Sjagger) and Mistle Thrush (Misteldrossel) have also been recorded at Blåvand this month. Jonas had another demonstration mid-morning, coinciding well with a variety of birds for the beginning of spring. Even with misty conditions throughout most of the day, Bullfinch (Dompap), Tree Sparrow (Skovspurv), Starling (Stær) and White Wagtail (Hvid Vipstjert) were seen or heard. The haze even caused confusion at one point, when I briefly mistook a male Chaffinch for a pinkish warbler-like bird at a distance. Otherwise we did not spot many finches...but there should be more decent weather to facilitate their migration in the remaining days of March.